BECAUSE ALLAH IS A PERFECT CREATOR. BECAUSE EVEN NON-MUSLIMS FOLLOW ISLAMIC WAY OF LIFE. BECAUSE NO-ONE CAN TOP THE INFALLIBLE A.S.
Zahra Foundation has circulated this email to you to keep you updated with current developments. Your email was collected from websites to do with Pluralism, Interfaith, Mosques, Educational Organizations, Schools, OR YOU’RE A FRIEND; OR EVEN YOU ASKED, etc. Please reply with ‘unsubscribe’ if you so wish. If God sent a religion, how would people who do not know of the religion believe in it? What means did God put in the human beings by which they can decide right from wrong? Surely the religion was not revealed to the whole of humanity at once. It must have started from one point. How would others know of it and more so accept it and believe in it? What is that one faculty that is shared by all human beings by which a message can be analyzed and determined to be right? The answer is quite simple; it is the human mind and the faculty of reasoning. It is the mind that helps us judge things and decides between right and wrong in every matter of our lives. The word of God, if it is to be transferred to other people who are foreign to it, must conform to the faculty of reasoning that God put in all of us. This is why in Islam faith in God is not the outcome of dogmas and doctrine but rather the product of reasoning and deep scrutiny of revelation. ONE CAN WRITE AN ENTIRE BOOK ON THIS. BUT THREE MAIN AREAS OF DISCUSSIONS. 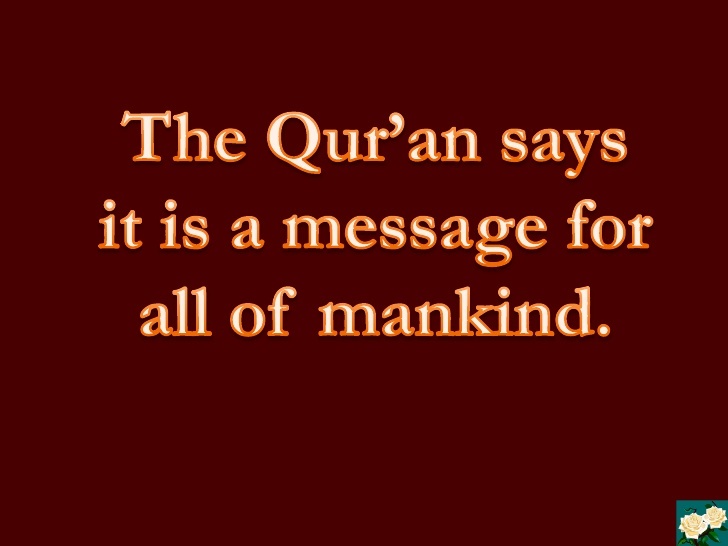 EVERY CREATION IS ISLAMIC. EVERYONE IS BORN A MUSLIM. PROPHET MUHAMMAD SAID THIS WHEN SEEN CRYING AND BURYING A NON-MUSLIM – I WISH I MADE AN INVITATION, TO THE DEAD PERSON, ABOUT ISLAM. IN DUA ABU HAMZA THUMALI WE SAY TO ALLAH …I AM NOT FIGHTING YOU AGAINST YOUR LORDSHIP…I swear with Your exalted might, O’ Master that if You rebuked me, I would not depart from Your door, and I won’t cease to compliment You, since I have indeed come to grasp the knowledge of Your generosity and benevolence. And You are the doer of whatever You desire, You punish whomever You wish, with whatever You wish and however You wish, and You bestow Your mercy on whomever You wish, with whatever You wish, and however You wish, I swear with Your exalted might, O’ Master, that if You rebuked me, I would not depart from Your door and I won’t cease to compliment. YOU ARE NEVER QUESTIONED ABOUT YOUR DOINGS, NEITHER IS THERE ANY STRUGGLE IN YOUR KINGDOM, NOR IS THERE ANY PARTNERSHIP IN YOUR COMMAND OR CONFLICT IN YOUR JUDGMENT AND NO ONE CAN OPPOSE YOU IN YOUR DISPOSITION OF AFFAIRS AND NO ONE CAN OPPOSE YOU IN YOUR DISPOSITION OF AFFAIRS. TO YOU BELONGS ALL OF THE CREATION AND COMMAND… and I take refuge through believing in Your unity, and through my certainty of knowledge about You, that indeed I have no other god or lord but You, only You; there is no partner for You.